The CEO of France’s oil and gas giant Total, Christophe de Margerie, was among four people killed in a business jet crash at Vnukovo Airport in Moscow after the aircraft hit a snowplow on take-off. Total’s chairman and CEO was the only passenger in the Falcon 50 business jet besides three crewmembers who were also French citizens. “Total confirms with deep regret and great sadness that Chairman and CEO Christophe de Margerie died just after 10pm (Paris time) on October 20 in a private plane crash at Vnukovo Airport in Moscow, following a collision with a snow removal machine,” the company said in a statement. During the taxiing before take-off, at around 0:10 am Moscow time on Tuesday, the light aircraft hit a snow-clearing machine, the head of Vnukovo’s press service, Elena Krylova, told the media. “A Falcon airplane that was en route from Moscow to Paris collided with a snowplow while the jet was preparing to take off. The plane caught fire after the collision and all the people onboard – including a passenger and three crew members - died,” Krylova said. The aircraft did not leave the ground after hitting the vehicle, she added, refuting earlier reports that the plane did eventually take off but then the pilot made a decision to turn back and land. The investigators have already found the aircraft’s black boxes while the airport staff were writing explanatory reports, she added. News portal LifeNews.ru reported earlier that the plane was in the air for a short period of time, sending distress signals and reporting an engine fire and fuselage damage, before it crashed on the runway, becoming engulfed in flames and killing everyone on board. Debris from the aircraft was scattered up to 200 meters from the crash site, according to the rescue services. The engine was found some 50 meters from the crash site, while one of the landing gears was ripped off and discovered nearly 200 meters from the main mass of debris. Vnukovo Airport temporarily suspended all flights following the incident, but by 2 am all operations were restored. While initials reports suggested only four people died in the tragedy, some sources claimed that five bodies were found at the crash site, one allegedly being the driver of the snowplow. The airport however later confirmed that the driver was not injured in the collision. “A criminal investigation has been opened into the violation of safety regulations after a light aircraft crash in the capital's Vnukovo airport,” transport official Tatyana Morozova told RIA. An investigative group is working at the crash site, Morozova added. Now investigators are focused on finding a video recording of the incident. Sibul also said that the jobs of a number of Vnukovo employees are in jeopardy. Earlier in the day, due to bad weather conditions at least 18 planes were diverted from Vnukovo to other Moscow airports, Itar-tass reported siting a source at Vnukovo. Flights landing at Moscow airhubs operate “on factual weather” conditions, meaning that a crew commander decide themselves about the possibility of landing at the destination or preceding to alternative landing routes at the capital. 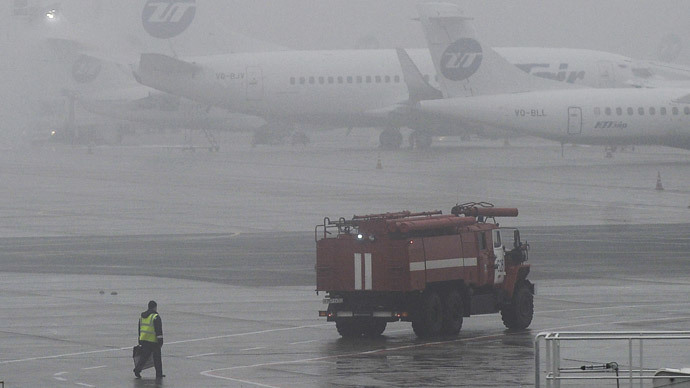 Some 12 planes have been received by Domodedovo airport while 6 landed at Sheremetyevo as dense fog and winter weather conditions make landing difficult. According to the source, 80 percent of the diverted races were private business jets. De Margerie, 63, joined Total in 1974 after graduating from the École Supérieure de Commerce in Paris. He served in several positions in the Finance Department and Exploration & Production division. In 1995, he became President of Total Middle East before joining the Total's Executive Committee as the President of the Exploration & Production division in May 1999. In May 2006, he was appointed a member of the Board of Directors. He was appointed Chairman and Chief Executive Officer of Total on May 21, 2010. Total SA is France's second-biggest listed company, with a market value of 102 billion euros and the West's fourth biggest oil and gas group, as well as one of the top foreign investors in Russia. Despite Western-imposed sanctions on Russia that prohibit western financing and technology transfer to some Russian energy projects, Total is continuing to pursue a natural gas project in Yamal, a joint venture with Russia's Novatek and China's CNPC. “Can we live without Russian gas in Europe? The answer is no. Are there any reasons to live without it? I think – and I'm not defending the interests of Total in Russia – it is a no,” the Total boss told Reuters back in summer. Meanwhile, another Total project, with Russia’s sanctions-hit Lukoil, is “definitely stopped,” de Margerie said in September, but since the project had not started it did not have “any impact” on Total, he told the Financial Times. De Margerie had recently expressed his support for a wider use of other currencies in transactions outside the US – for oil purchases in particular – after the scandal involving France’s largest bank, BNP Paribas, which was slapped with a record $9 billion fine and a 1-year dollar trading ban.